THE WIND IN THE WILLOWS isn’t merely a children’s tale about the escapades of the hapless Toad. Far from it. Just below the surface is a tale about the sanctity of the wild, and perhaps even the blessedness of an active outdoor life with trusted companions. And entombed in the text lies a deeper tale about the mystical qualities of Nature. 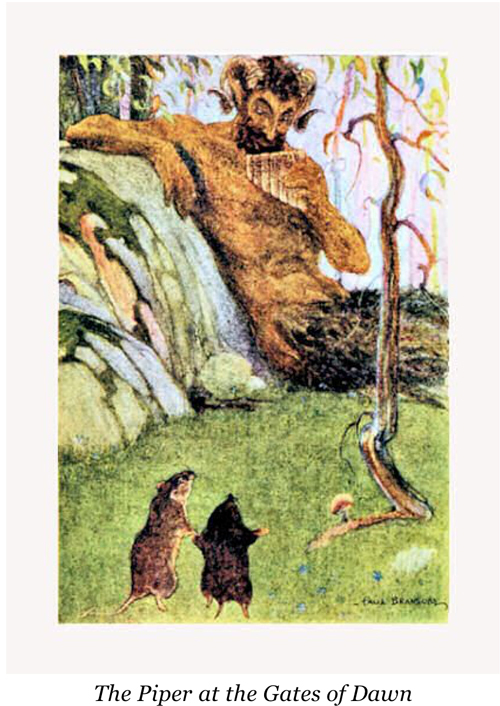 Nowhere is it more evident than in the seventh chapter, “The Piper at the Gates of Dawn.” Here, in an upwelling of the Greco-Pagan imagery, author Kenneth Grahame brings Ratty and Mole face-to-face with the great horned, hirsute and hooved eminence of a pipe-playing Pan. This isn’t the mischievous and randy Pan as the one in, say, Tom Robbins’s Jitterbug Perfume, a lusty badass who coaxes village women from their homes with pipe music, and releases them “after dusk, tangle-haired, grass-stained and stinking of the rut” (one shudders to consider that kind Pan lurking in The Wind in the Willows). Grahame’s Pan is a beneficent presence who rescues lost young creatures – in this case, it’s Otter’s little son, Portly – and whose gauzy music woos Mole and Ratty into a a swoon that has them rowing into a deep backwater and into his presence, which, upon returning to the river’s current, they promptly forget. Pan’s piping imbues Mole and Rat with a kind of wonder that perhaps reminds them of their rightful place as the true inheritors of the wild – a wild upon which humans have encroached (In fact, there’s evidence of the human stain throughout the book – an imprint wiser animals seek to avoid.) Despite his human torso, arms and head, Pan is fellow creature: “Some— great— animal— has been here,” [the Rat] murmured slowly and thoughtfully; and stood musing, musing; his mind strangely stirred. “Lest limbs be reddened and rent— I spring the trap that is set— As I loose the snare you may glimpse me there— For surely you shall forget! Interesting that Grahame follows this most numinous of chapters with “Toad’s Adventures,” which, for all its madcap theater, shows Toad miserably entrapped in human contrivances – “within walls” — forced to don a washerwoman’s garb and hop a train to escape his gaolers pursuing him in an automobile – all signifiers of the industrial revolution that was transforming England’s hills and dales, smokestacks outnumbering the steeples of country churches. Grahame, a bank executive who pined for his childhood days playing on the River Thames, apparently wrote The Wind in the Willows in 1908 for his small, mentally disturbed son, whom he nicknamed “Mouse.” A lesson to hark to wildness when losing one’s way? We know that Pan was somewhat in vogue in the literature and art of the era: remember J.M Barrie’s Peter Pan? However inspired, Rat and Mole’s encounter with the great woodsy god sounds a base note that deepens The Wind in the Willows and provides a reminder to our runaway culture to heed the piper at the gates of dawn: preserve wildness, within and without. Here we join “The Piper at the Gates of Dawn” as Rat and Toad go in search of the lost young otter, Portly. The line of the horizon was clear and hard against the sky, and in one particular quarter it showed black against a silvery climbing phosphorescence that grew and grew. At last, over the rim of the waiting earth the moon lifted with slow majesty till it swung clear of the horizon and rode off, free of moorings; and once more they began to see surfaces— meadows wide-spread, and quiet gardens, and the river itself from bank to bank, all softly disclosed, all washed clean of mystery and terror, all radiant again as by day, but with a difference that was tremendous. Their old haunts greeted them again in other raiment, as if they had slipped away and put on this pure new apparel and come quietly back, smiling as they shyly waited to see if they would be recognised again under it. Slowly, but with no doubt or hesitation whatever, and in something of a solemn expectancy, the two animals passed through the broken, tumultuous water and moored their boat at the flowery margin of the island. In silence they landed, and pushed through the blossom and scented herbage and undergrowth that led up to the level ground, till they stood on a little lawn of a marvellous green, set round with Nature’s own orchard-trees— crab-apple, wild cherry, and sloe. Then suddenly the Mole felt a great Awe fall upon him, an awe that turned his muscles to water, bowed his head, and rooted his feet to the ground. It was no panic terror— indeed he felt wonderfully at peace and happy— but it was an awe that smote and held him and, without seeing, he knew it could only mean that some august Presence was very, very near. With difficulty he turned to look for his friend, and saw him at his side, cowed, stricken, and trembling violently. And still there was utter silence in the populous bird-haunted branches around them; and still the light grew and grew. first rays, shooting across the level water-meadows, took the animals full in the eyes and dazzled them. When they were able to look once more, the Vision had vanished, and the air was full of the carol of birds that hailed the dawn. “Some— great— animal— has been here,” he murmured slowly and thoughtfully; and stood musing, musing; his mind strangely stirred. Portly had soon been comforted by the promise of a treat— a jaunt on the river in Mr. Rat’s real boat; and the two animals conducted him to the water’s side, placed him securely between them in the bottom of the boat, and paddled off down the backwater. The sun was fully up by now, and hot on them, birds sang lustily and without restraint, and flowers smiled and nodded from either bank, but somehow— so thought the animals— with less of richness and blaze of colour than they seemed to remember seeing quite recently somewhere— they wondered where. “It’s like music— far-away music,” said the Mole, nodding drowsily. “Lest limbs be reddened and rent— I spring the trap that is set— As I loose the snare you may glimpse me there— For surely you shall forget! Row nearer, Mole, nearer to the reeds! It is hard to catch, and grows each minute fainter.